Chocolate Cake with a Tickle of Red Pepper Flakes – Some like it (a little) hot! 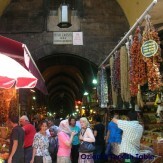 I have been hooked by the Spice Trip TV program where one of my favorite chefs Stevie Parle and the spice expert Emma Grazette have been travelling around the world to discover the wonderful, magical world of spices. They have been to Mexico a few weeks ago, exploring the chillies and Stevie produced a gorgeous looking Mexican style chocolate cake with chilli flakes in it. Chillies are so varied in Mexican cuisine and they do appear at sweet and savory dishes – not to forget the famous Mexican hot chocolate with chilies. 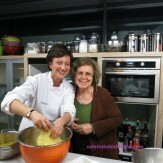 I loved the idea of the warmness a touch of red pepper flakes would bring to the cake. Since then, I have been very tempted to reproduce this delicious, very easy chocolate cake, using Turkish red pepper flakes. We Turks notoriously add red pepper flakes to almost all savory dishes, but experimenting with chillies in cakes and desserts was a first for me, so I must say, I was cautious. The original recipe asks for 2 tsp dried chilli flakes – I used just a shy of 1 1/2 tsp Turkish red pepper flakes, as they have a strong, smoky flavor. 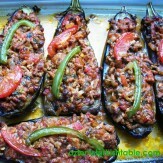 The result was a delicious but not overpowering touch of spice that gets you after a while, and brings you warmness. Here is what my 8 year old son thought of the cake; “ You get the yummy chocolate taste first, then in a while you feel a tickle of spice, I liked it”. We enjoyed this spicy twist to the chocolate cake and I liked the surprise element to it and seeing the smiles on friends who tried! Have you added chillies to your sweet creations before? I would love to hear your experiences. This recipe is slightly adapted from Stevie Parle’s original recipe, which also calls for 2 tbsp tequila – a delicious addition. You can decorate your cake with pomegranates seeds for a festive look and taste. Line a 23cm round cake tin with grease proof paper and grease with butter. Chocolate and red pepper flakes; rather unusual yet surprisingly delicious. 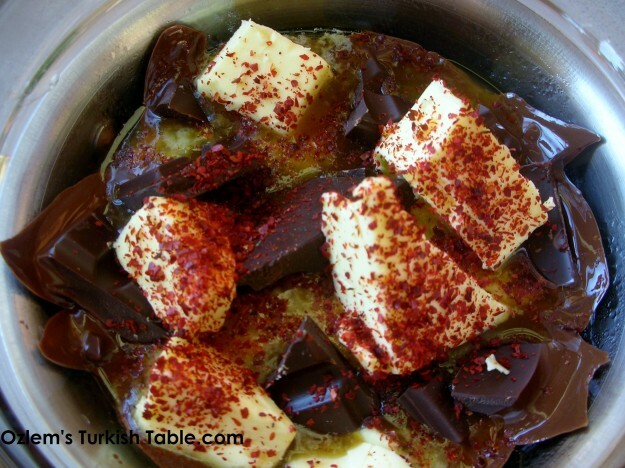 Melt the chocolate, butter and red pepper flakes in a glass or metal bowl over a pan of barely simmering water, taking care not to burn the chocolate. The bowl must not touch the water as this will split the mixture. Remove from the heat, stir and leave for a few minutes to cool. 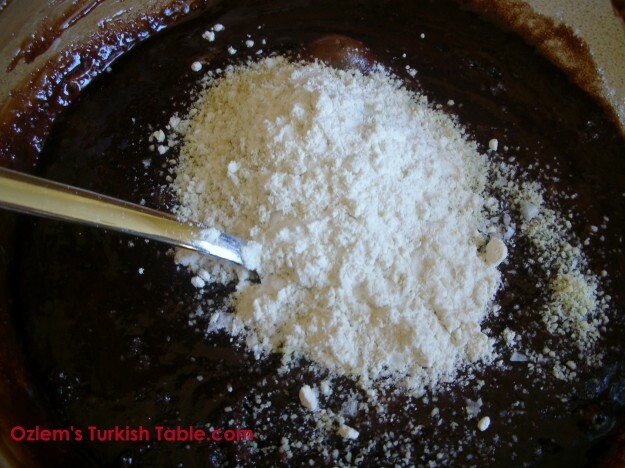 Stir in the ground almonds and the flour to the chocolate mixture; the ground almonds are not only healthy but also keep the cake deliciously moist. Stir in the eggs, one by one, and then the sugar, followed by the almonds, flour and a pinch of salt. Pour the batter into the cake tin and sprinkle with the salt flakes. Bake for 20 minutes. The chocolate cake with red pepper flakes, baked - ready to cool. Leave to cool, then cut into slices. It is a rich, moist cake, so you don’t need thick slices. 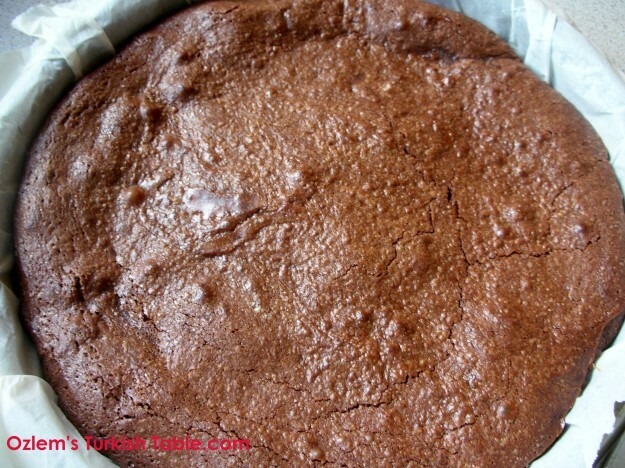 The chocolate cake has a nice crust but it is deliciously moist inside. The cake looks lovely and festive when decorated with pomegranate seeds. 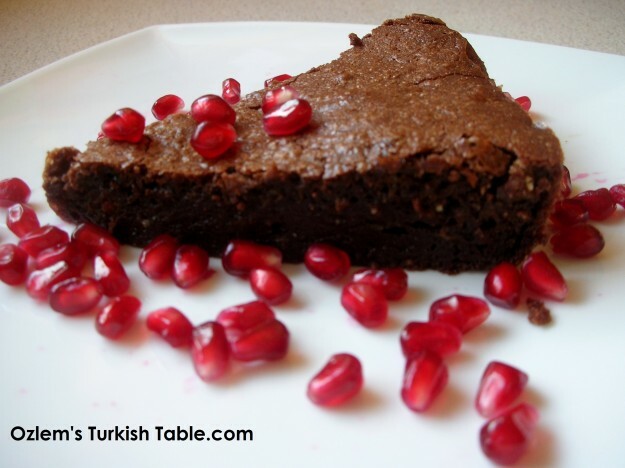 The tangy taste of the pomegranates also complement the rich chocolate cake well. Covent Garden, London, looking very festive, December 2010. A more recent photo will follow shortly! Lamb Kebabs with Pistachios on Flat Bread, served with Roasted Peppers, Onions and Tomatoes – Create Delicious Kebabs in Your Home! 21 Responses to Chocolate Cake with a Tickle of Red Pepper Flakes – Some like it (a little) hot! I love your son’s “tickle ” of spice. Very apt. 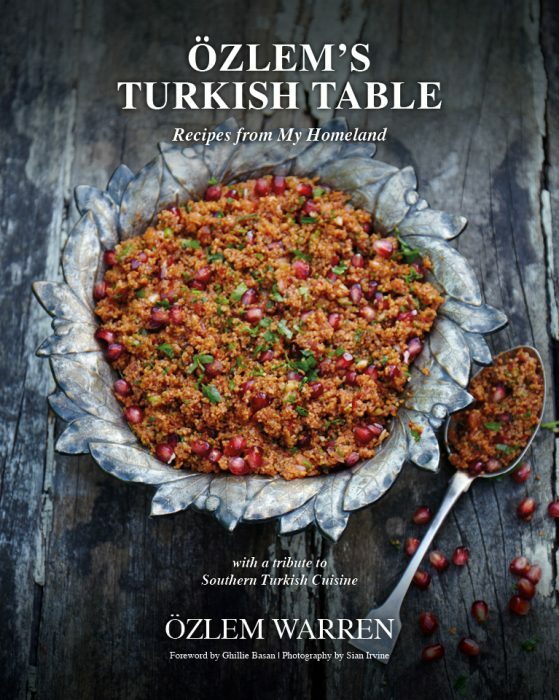 Özlem, this looks lovely! Very tempting. 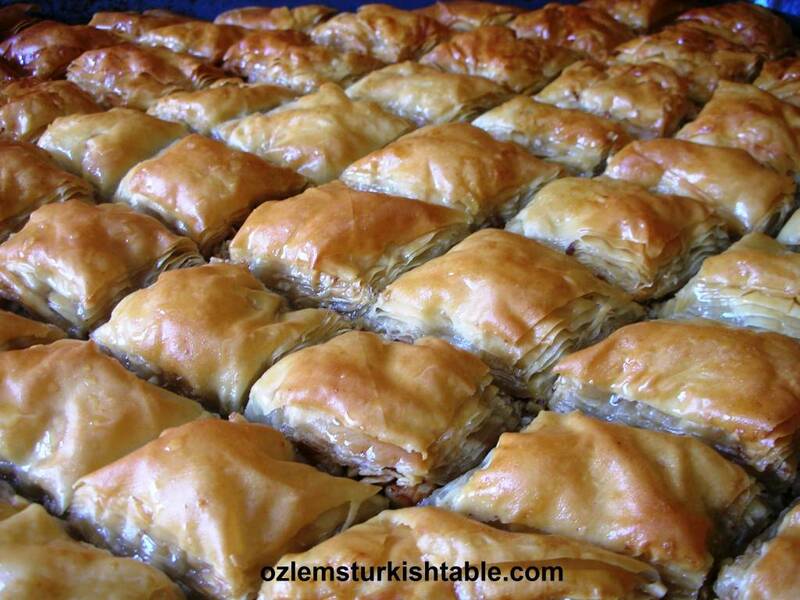 Wishng you and all the family a lovely holiday season – Noeliniz Ve Yeni Yiliniz Kutlu Olsun! 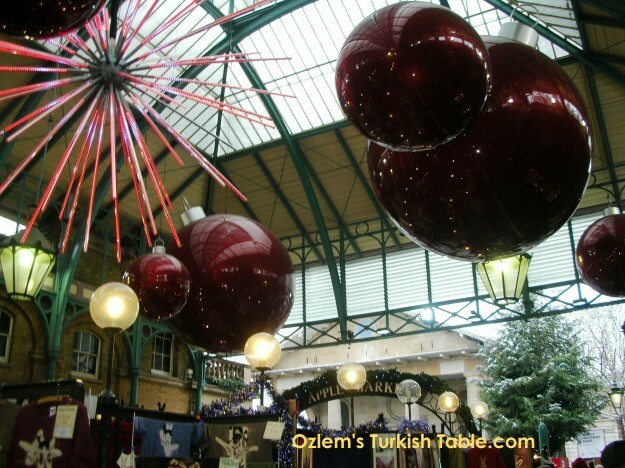 Many thanks Barbara – wishing you a lovely Noel and mutlu yillar! great looking cake. i made chocolate shortbread cookies with red pepper and though my family loved them, my friends wouldn’t eat them. they are way too fussy! thanks Jaz, would love to try your shortbread cookies – spice is not everyone’s thing, so I understand that, thanks for sharing! Oh my goodness, this looks so delicious! I love the combination of chocolate and chili together… and the way you served it with pomegranate seeds makes it look so colorful and refreshing! Yum. 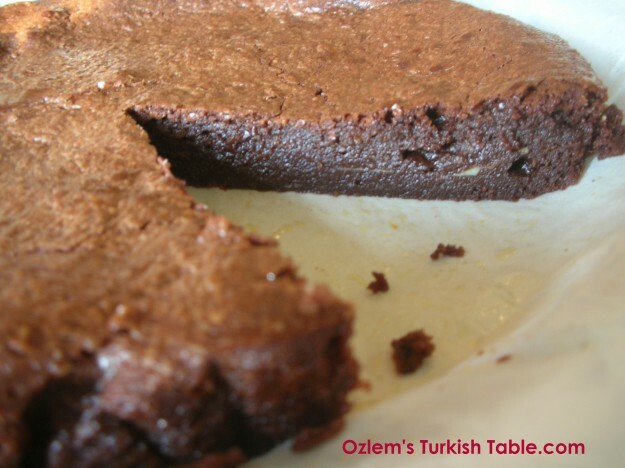 Ozlem, this cake with red chili flakes is making my mouth water just at the sight of it:) looks simply delicious and comforting:) spices and chocolate are a combination made in heaven! I’m trying it out soon. XxPeri. That looks beautifully moist. I think the little hint of heat is very welcome in chocolate desserts and cakes, especially if they’re fairly rich. Somehow it seems to complete the flavour experience, if you know what I mean.